Brand new twin flat sheet (my pic is king but this one is full) in 300TC poplin Avenue Espresso brown. I took a pic out of the package so you can see the color better. This style is so comfortable!! It's smooth but cool and crisp. This is old stock from Ralph Lauren's better lines. Made in India, finished in Italy, sewn in USA. Pet and smoke free storage. Free shipping! Rachel Ashwell. Pink Rosebuds Scattered on Pink Ground. Simply Shabby Chic. Simply Shabby Chic is a mix of English. Machine Wash. Tumble Dry. 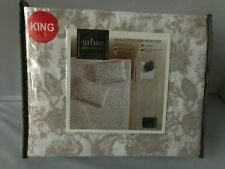 King Flat Sheet: 110 in x 104 in. King Fitted Sheet: 78 in x 80 in x 16 in. Coordinate to all Martha Stewart Whim Collection. 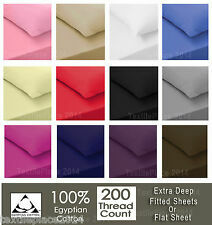 200 Thread count 100% cotton percale. Color : Green, yellow and white with dapple clue pattern. Martha Stewart impression stripe 3-piece twin sheet set includes . Ralph Lauren Bayview. Blue Striped Pillowcases. 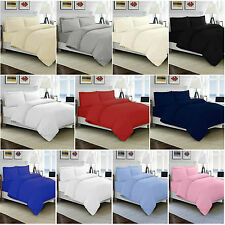 2 Standard Pillowcases of 100% cotton - 20" x 26" pillows / 20" x 30" finished size. when you walk into your bedroom. 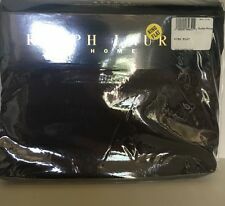 The quality of Ralph Lauren at a affordable price. 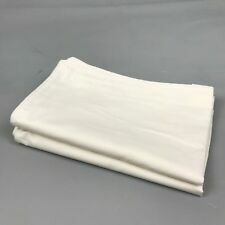 D&M Bedding 300TC 20"x26" STANDARD COTTON COVER. Our 300 Thread Count pillow protector is made by 100% cotton. It is zippered for complete protection and will extend the life of your pillow. Machine wash cold, Tumble dry low. 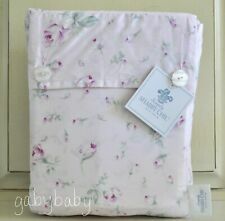 Lovely cottage chic oversized pillowcases from Antonio Melani...Thorpe collection...made from Liberty fabric. Features an all white pillowcase with a generous 4" ruffled edge in a bright multicolored floral. Holds standard, jumbo, or queen pillows. Retail $50. BRAND NEW 32X21" 100% COTTON MACHINE WASHABLE. 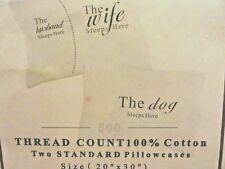 From DKNY a set of (2) Standard/Queen size ~ 100% Organically Grown Cotton Pillow Cases in a draw-string sack. Finished size: 21" x 32" (53 cm x 81 cm). SLEEPOSOPHY COLLECTION. KING & QUEEN OF OUR CASTLE. Add cabin charm and rustic flavor to your bedroom decor with the Parker Pillowcases. Featuring an all over plaid with shades of warm burgundy, natural, and deep navy in 100% cotton fabric. Parker Pillow Case Set. Dress your lodge bed with the Tea Cabin Green Plaid Standard Pillow Case Set. Tea Cabin Green Plaid Standard Pillow Case Set. I have all the accessories you need to make your quilt ensemble complete. Muted caviar black stripes on a pale khaki background give your pillows a "pop" without overwhelming the rest of the room. The Kendra Stripe Black Pillow Case Set is made with 100% cotton. Kendra Stripe Black Pillow Case Set. 100% soft cotton. Set contains two pillowcases. Buffalo Black Standard Pillowcase Set (2). Machine Wash. Color: Black, Antique White. Cover: 100% Soft Cotton. 1 Pillowcase: 20 in x 32 in (50.8 cm x 81.3 cm). Wrinkle Free Out of the Dryer. 300 Thread Count. Full Sheet Set. 1 Fitted sheet: 54 in x 75 in x 14 in (137.2 cm x 190.5 cm x 35.6 cm). 1 Flat sheet: 82 in x 96 in (208.3 cm x 243.8 cm). THE SEASONS Collection HEAVYWEIGHT Flannel 2 KING Pillowcases Blue Plaid NEW. Condition is New with tags. Shipped with FedEx Ground or FedEx Home Delivery. 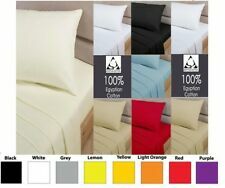 Dakota Standard Pillowcase Set (2). 100% soft cotton. Set contains two pillowcases. Machine Wash. Color: Black, Khaki. Cover: 100% Soft Cotton. Muted bronze green stripes on a pale khaki background give your pillows a pop without overwhelming the rest of the room. The Prairie Winds Green Ticking Stripe Pillow Case Set is made with 100% cotton. The softest sheets you will ever sleep on, they’re crafted out of 100% cotton sateen with a 300 thread count for increased durability and luxurious, soft comfort. AESTHETICALLY PLEASING LOOK. In addition to the vibrant shades, the dobby stripe pattern contributes to the aesthetically pleasing quality. Lovely cottage chic oversized pillowcases from Antonio Melani...Forest Rd collection...made from Liberty fabric. Features an all white pillowcase with a generous 4" ruffled edge in a mini floral in shades of blue, red, and pink. Holds standard, jumbo, or queen pillows. Retail $50. BRAND NEW 32X21" 100% COTTON MACHINE WASHABLE. Hi! Welcome to Weaim2pleez. 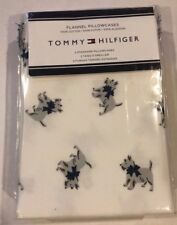 Here is a set of 2 Jingles & Joy Bulldog Standard Pillowcases. Includes 2 standard pillowcases (20" x 30"). Made of 100% cotton. White with winter bulldog and snowflake graphics. BRAND NEW in package! BUY IT NOW!! . The Dawson Star pillowcase set is an easy way to add depth and contrast to your bedroom decor. 100% cotton in rustic shades of woodland brown and khaki plaid. Dawson Star Pillow Case Set. I have all the accessories you need to make your quilt ensemble complete. It features a double pleated cuff finish and have a natural softness and durability to give you the greatest comfort. Colour - White by Logan & Mason. King Size fitted Sheet Set. Also available in QUEEN size. Periwinkle blue check. One std Pillowcase. Our 300 thread count pillow protector is made from 100% combed cotton. It is zippered for complete protection, which will extend the life of your pillow. Machine wash cold, Tumble dry low. Thread Count: 300. Westbury Manor 100% Cotton Luxury Pillowcases. Four King size, white pillowcases. Let your pillows do the talking with these fun pillow cases. One of the white cases has the words "GIRL" and the other one says "POWER". On the pillow that says girl the I is in the shape of a pink rose.